A report published by TheCable has revealed that Atiku Abubakar, Peoples Democratic Party (PDP)‘s presidential candidate, paid $30,000 to Fein & DelValle PLLC, a US firm. Recall that Naija News earlier published that the PDP presidential candidate had reportedly tried to lobby the US to accept him as the President-Elect. Abubakar is said to have sought the services of the company in his bid to unseat President Muhammadu Buhari. 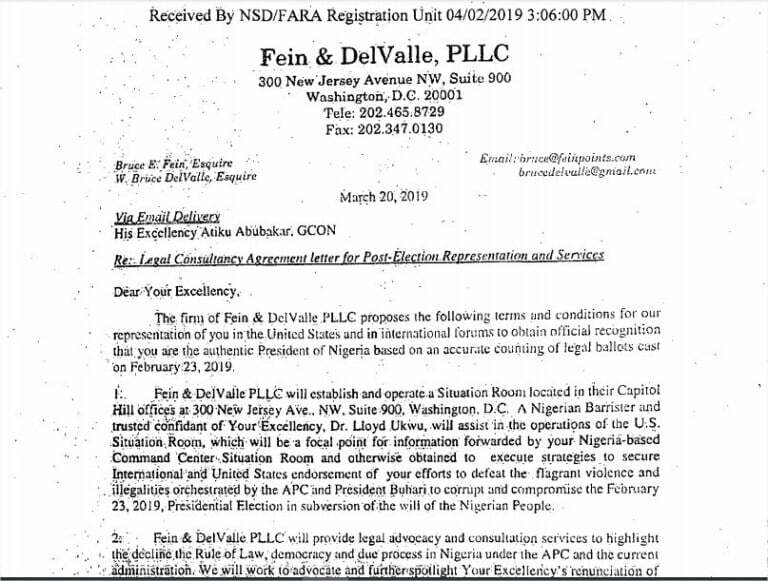 In its terms and conditions for representation, Fein & DelValle PLLC had said it would establish and operate a situation room located in its capital hill offices in the US and enlist the services of Lloyd Ukwu, a Nigerian barrister and trusted confidant of Atiku, to assist in the operation of the situation room. Also, the firm had proposed to execute strategies to secure the US endorsement of Atiku’s efforts to defeat what it called “flagrant violence and irregularities orchestrated” by the All Progressives Congress (APC) and Buhari to compromise the presidential election. However, twenty-four hours after the report was published, Atiku had denied the allegations levelled against him. However, TheCable who saw the document affirmed that Atiku paid the money to the firm two days after signing a 90-day contract (April 1,2019, to July 1, 2019). He signed the contract on March 24 and paid the money on March 26. According to the report, the amount was budgeted for costs and expenses for the 90-day period. In addition, the agreement was for Atiku to separately pay all pre-approved international travels, business class. 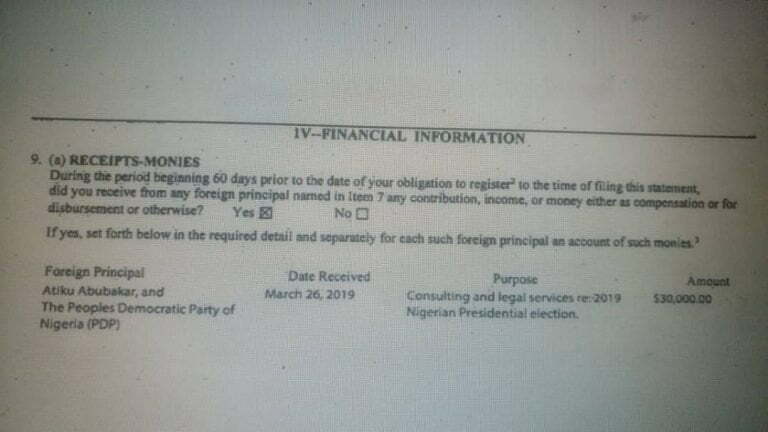 According to the firm, $30,000 was received from Atiku on March 26, which was confirmed in item 9(a) under the financial information clause of the registration statement. At the time this report was filed, Atiku’s spokesman had not responded to inquiries on this development.